Imagine a child, alone in the hospital facing cancer treatment. Scary, right? Now imagine that little one waking up in the morning to a bright, handmade pillowcase covered with a pattern of beautiful fish, colorful flowers or funny frogs. It is perhaps a small comfort, but it’s enough to help a frightened child start the day with a smile. This is the goal of Churchville-Chili Middle School seventh-graders as they create pillowcases for the Golisano Children’s Hospital, through a program called Ryan’s Case for Smiles. 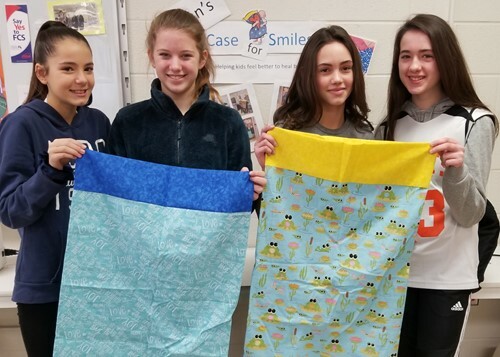 By the end of the year, over 300 Churchville-Chili Middle School FACS students will have contributed their skills to the service project, resulting in an expected donation to the hospital of about 150 fabulous pillowcases made with love. Feature photo: Tyler Nguyen and Olufemi Akinpelu display their dynamically-patterned pillowcase. This page: FACS students (l-r) Alyssa Benedetto, Laura Bunk, Madison Hauck and Julia Lennon with their cheerful pillowcases.